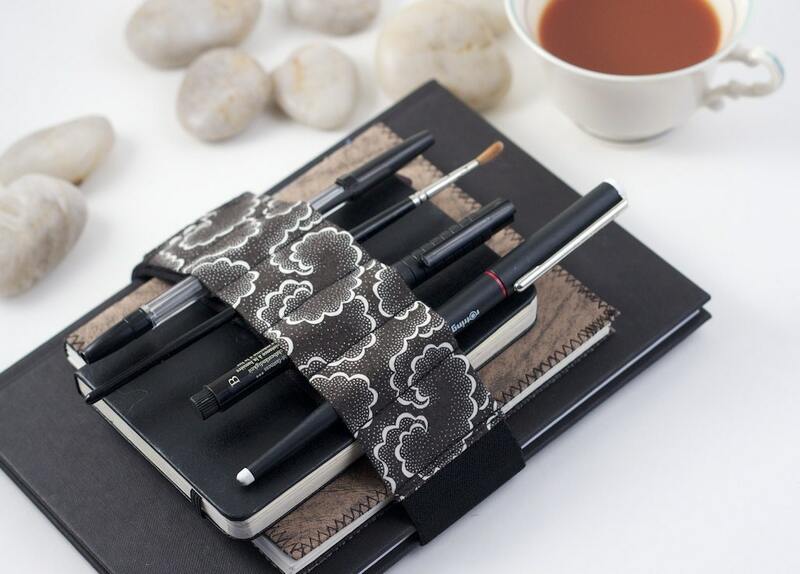 A strap fitted with small loops for carrying pens, pencils, and other handy tools wrapped around a journal, planner, or other book. Who needs an adjustable bandolier? Adjustable bandoliers are great for people who are experimenters, who try a new journal each time they fill the old one, explorers always on the look out for something different, the "librarians" who have a couple of books going at a time. Gift givers who are unsure of the book the bandolier is for. This bandolier can fit a variety of sizes, or strap a couple books together. Keep your pens and pencils with you when and where you need them. Travel light, draw often. I sew the strap of this bandolier using sturdy cotton canvas and velcro so you can fit it to many different sizes of books. - This bandolier is 2 inches wide. - It is 23" long & fits circumferences from 9" to 22"
- Each of the 6 slots is approximately 1 inch wide and will fit tools up to the size of a standard sharpie marker. Each bandolier is handmade and will have slight variations from the photograph. Yup, its true Journal Bandolier is Trademarked. Love it! Took it on a business trip last week and every person who saw it thought it was a fantastic idea! I actually got it to use with a larger planner, but it works for both so well. I’ve been thinking about getting one of these bandoliers for more than a year, and my expectations for the product were more than surpassed. A truly fantastic product. Mine is currently holding 2 composition books, 2 books, a kindle, and a planner, with some room to spare. Beyond thrilled with this product, which arrived thoughtfully and exquisitely packages.